Many of us are using USB drives these days as the prices have fallen down. If you use your jump drives regularly then you might want to backup the data in it automatically. 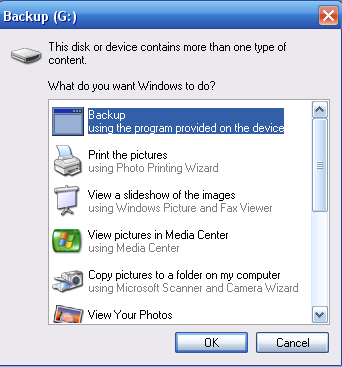 I came across this article by Sandstorming.com on how to automatically backup your pen drive when you insert it. According to the article it has just four simple steps and if you do them correctly you should be getting this screen when you connect your pen drive. I have not tried this yet if any of you guys try this then please comment in this post.